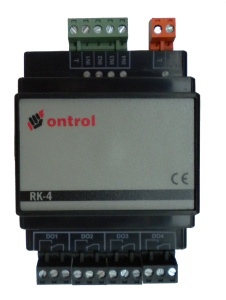 RK4 is intended for use with various Ontrol controllers, or other BMS systems, to enable on/off switching of loads. It provides 4 independently switchable relays. For each relay, both normally-open and normally-closed contacts are available for wiring. LEDs indicate status of the relays and supply voltage. RK4 has two modes of operation. Analog Control : A 0-10 V input is provided for controlling each relay independently. In this mode, the RK4 is a general-purpose analog-to digital converter that can be used with any BMS controller. See specifications for switching voltages. Ribbon-cable connection : When connected to a compatible Ontrol controller via the ribbon cable connection, the relays are directly controlled by the attached controller. In this case, analog input terminals are not used.